My main interests are in instrumentation and exoplanets. I am currently building DEMONEX (DEdicated MONitor of EXotransits) with Scott Gaudi in order to monitor all known transiting exoplanets for my PhD Thesis. To the right is a picture of it in Columbus on its test trailer in 2007. It was installed in its permanent location at the Winer Observatory in Sonoita, AZ in April/May of 2008. You can see a time lapse video of a night observing in 2009. I created an online BJD calculator which converts a UTC time to BJDTDB, the Barycentric Julian Date in Barycentric Dynamical Time (and back), for any place on Earth or from any spacecraft. The IDL source code is also available for higher precision or inclusion in your own scripts, and a thorough discussion of everything it entails can be found in my paper. I published a paper with Paul Martini on the AGN fraction in high redshift galaxy clusters, which subsequently got a Chandra press release. In the Summer of 2006, I stayed at the Large Binocular Telescope (LBT) to help commission the Large Binocular Camera (LBC) and realuminize one of the 8.4 meter primary mirrors (SX). In August of 2007, I helped aluminize the other mirror (DX). In September of 2007, I tested and commissioned the MDM 4K. 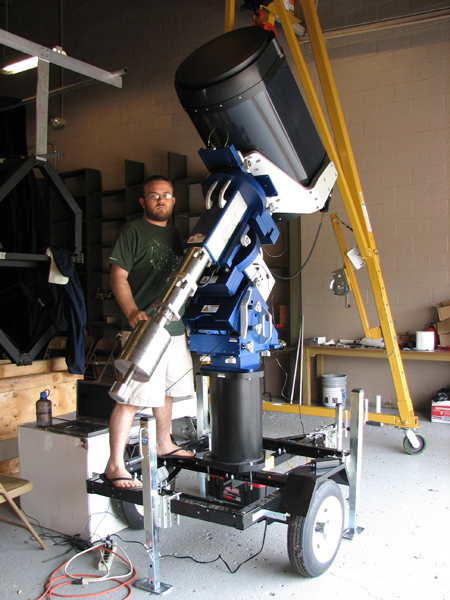 As an undergraduate, I helped build the Perkins Re-Imaging SysteM (PRISM) instrument for the 72" Perkins Telescope in Flagstaff, Arizona. It is a multi-object optical spectrometer, re-imager, and polarimeter. I also worked with Kenneth Janes on the photometry of old open clusters. In my spare time, I like to do astrophotography.